Looking for savory puff pastry recipes? You’ve found a great one! 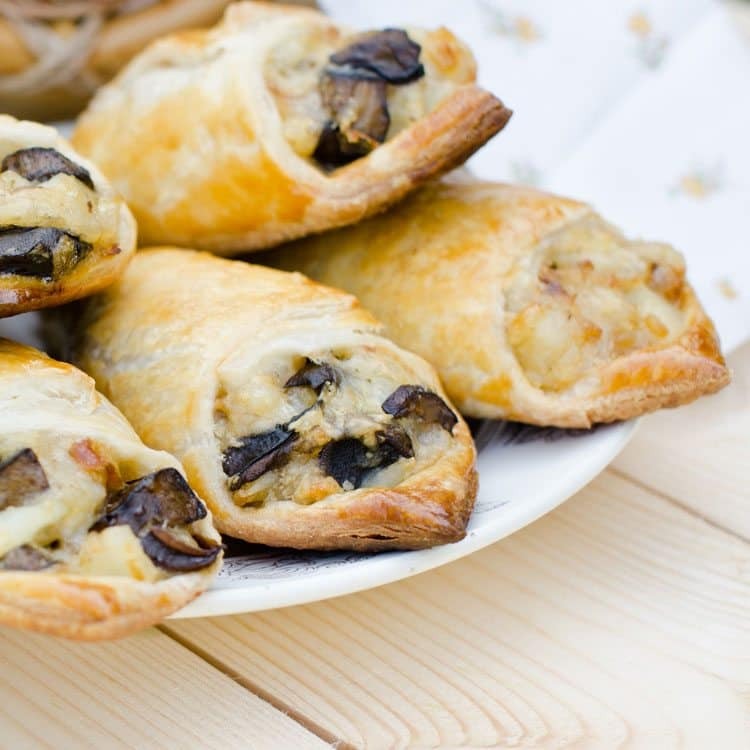 Puff Pastry Bites with Caramelized Onions and Mushrooms hits all the right notes. I love working with puff pastry dough. You can use it to make savory puff pastry recipes, sweet puff pastry recipes, breakfast puff pastry recipes, puff pastry appetizers… the list goes on. It’s incredibly versatile and, quite frankly, pretty fun to use! I once heard puff pastry referred to as a “blank canvas” and I think that’s a pretty accurate description. It’s made from the same ingredients as pie pastry, but the dough is folded so many times in incredibly thin layers that it puffs up when baking, creating those flaky, buttery, mouthwatering layers that we all know and love. If you have an afternoon to spare in the kitchen, making puff pastry dough from scratch (with just flour, salt, butter, and water) is a rewarding process. But if an afternoon spent creating dough isn’t feasible with your schedule, there is no shame in the easy route! Nine times out of ten, if I am going to make a recipe (like this savory puff pastry recipe) using puff pastry, I just pick up a box of frozen puff pastry sheets at the grocery store. (You can also buy frozen puff pastry shells and puff pastry cups for other types of recipes.) 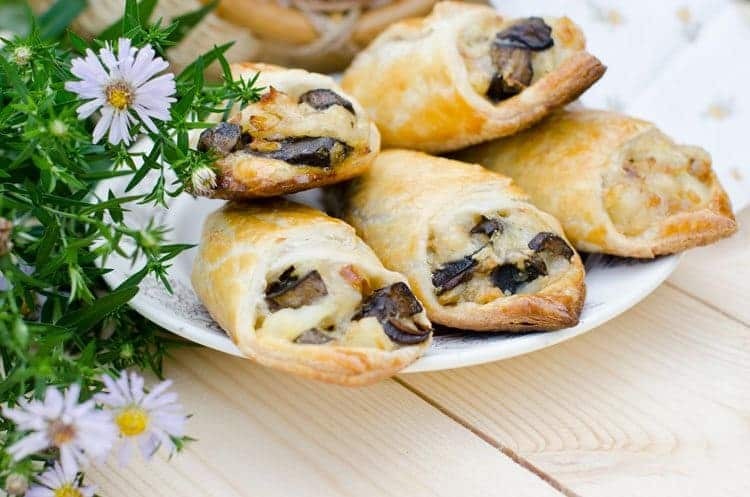 That way I can focus my attention on making the recipe itself, like these Puff Pastry Bites with Caramelized Onions and Mushrooms. They can be served as an appetizer, breakfast food, or brunch food. These puff pastry bites make an excellent appetizer at parties (you might want to make a double batch because they go quickly! ), but they’ll work great served as a breakfast or brunch food as well. The flavor combination is on point. 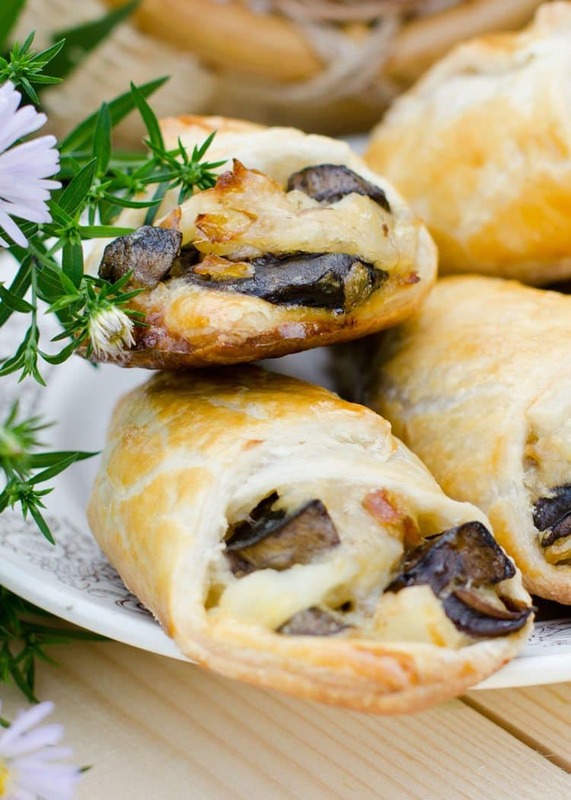 Sweet caramelized onions, marinated Portabella mushrooms, flavorful smoked Applewood cheddar, and fresh thyme, all wrapped up in flaky, buttery puff pastry. How can you go wrong with that? They’re satisfying. Instead of being carb-heavy like some small bites, each puff pastry bite has a good balance of fat, carbs, and protein, meaning you’ll walk away feeling satisfied. You’ll have extra caramelized onions. How many recipes help you plan for future meals? This recipe calls for you to caramelize four large yellow onions even though you won’t use all four in the final puff pastry bites. Caramelizing onions takes some effort, so you’ll caramelize more than you need and save the extra for later. They can be stored in an airtight container and refrigerated for up to a week, or you can freeze them and pull them out when you need them. Try them in soups, on sandwiches, or on top of pizza! When making the caramelized onions, don’t cut the onions too thin or they may burn during the cooking process. Before you grate the Applewood smoked cheddar cheese, put it in the freezer for 10 minutes. This will make it much easier to grate. I hope you enjoy this recipe! If you would like a sweet puff pastry recipe, try Clementine Palmiers – A quick and easy recipe using puff pastry dough. If you've been looking for savory puff pastry recipes, you'll love these Puff Pastry Bites with Caramelized Onions and Mushrooms. Place puff pastry dough in the fridge overnight to thaw. Over medium-high heat, heat 2 tbsp. olive oil in a large skillet. When the olive oil is hot, add the marinated mushrooms. Sauté until tender and browned, which will take approximately 5-7 minutes. Remove from heat, transfer to bowl, and set aside. Slice off both ends of onions, remove papery outer layers, and cut lengthwise from tip to root. Next, cut each half across the middle to create four sections. Cut each of the four sections lengthwise into strips. (Be careful not to cut the onions too thin; this will cause them to burn while cooking.) Melt butter in a large skillet with high sides over medium heat. (Do not use a non-stick pan if possible.) Add onions and use a wooden spoon to stir and coat them with butter. Cook onions for approximately 45-50 minutes. Stir every five minutes to help them cook evenly and ensure they don’t stick to the pan. (The exact cooking time will depend on a few factors, including onion age and the size of each batch.) Once the onions have reached your desired caramelization, deglaze the pan with white wine. Add enough liquid to allow you to scrape up the brown bits. Add salt and pepper to the onions to taste, and then remove them from the heat and let them cool in the pan. When they’re cool, transfer any unused onions to an airtight container. Next, preheat oven to 375 degrees. Using parchment paper, line two large, rimmed baking sheets. Set these aside. Using thawed puff pastry dough, cut it in half and roll it out onto a lightly floured surface. Take a pizza cutter or sharp knife and cut the first batch into 32 equal rectangles. Transfer rectangles to the prepared baking sheet and freeze for 10 minutes. Repeat this process for the second batch of puff pastry. Remove puff pastry sheets from the freezer and allow them to sit for a few minutes. Then, brush each piece with beaten egg. Arrange (carefully!) equal amounts of cheese, onions, and mushrooms on each puff pastry piece. Sprinkle fresh thyme leaves on top. In the preheated oven, place baking sheets and bake puff pastry bites for 10-15 minutes before rotating each sheet to ensure even cooking. Continue cooking until the pastries have turned a golden brown color, which will take approximately 8-10 additional minutes. Remove from oven, allow them to cool, and serve!